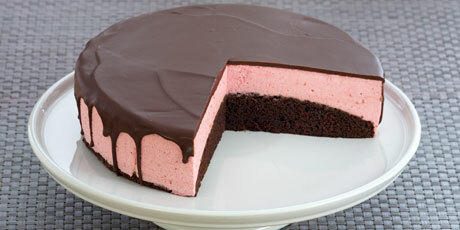 This torte is made of a chocolate-coffee cake base and filled with a homemade raspberry mousse, all topped off with a bittersweet chocolate ganache glaze. 1. For the cake, preheat the oven to 350 ºF (180 ºC). Grease a 9-inch (23 cm) cake pan and line the bottom with parchment. Dust the sides of the pan with flour, tapping out any excess flour. 3. Stir the hot coffee, milk, egg and vanilla together and add it all at once to the flour mixture, blending until smooth and then increase the speed to medium and whip until pale and thick, about 3 minutes. Pour the batter into the prepared pan and tap it on the counter to eliminate any bubbles. 4. Bake the cake for about 30 minutes, until a tester inserted in the centre of the cake comes out clean. Cool the cake for 20 minutes in the pan, and then tip out onto a cooling rack to cool completely to room temperature. The cake can be baked a day ahead, wrapped and stored at room temperature before assembling. 5. To prepare for assembly, lightly grease and line the sides of a 9-inch (23 cm) springform pan with parchment paper so that it comes just a little above the top of the pan. Set the cooled chocolate cake into the bottom of the pan. 1. For the raspberry mousse, puree and strain the raspberries and measure out 1 cup (250 mL) to use. Whip the cream to a soft peak, stir in the vanilla, and chill until ready to assemble. Stir the gelatin into ¼ cup (60 mL) of cool water in a small dish and set aside. 2. In a large metal bowl, whisk the egg yolks, whole egg, sugar and lemon juice together. Place the bowl over a pot of gently simmering water and whisk constantly and rather vigorously (or you can use electric beaters) until they are frothy and doubled in volume, and registers 175 ºF (80 ºC). Remove the bowl from the heat and whisk in the softened gelatin (the mixture will go fluid). Whisk in the raspberry puree – this will cool down the mixture, but make sure it has cooled to room temperature before folding in the whipped cream in 2 additions. Pour the mousse into the pan and spread to level if needed (the mousse will be somewhat fluid at this point). Chill the mousse for at least 6 hours before unmolding (this can be done a day ahead of serving. 1. For the ganache glaze, put the chocolate, butter and corn syrup in a small metal bowl and place this over a small pot of barely simmering water, stirring with a spatula until melted. Set aside to cool slightly until it is at room temperature and a little thickened (you can re-warm if it sets up too much, or if you make it ahead). 2. Remove the ring from the springform pan and peel away the parchment paper from the mousse. Carefully transfer the cake onto a serving platter or cake stand. Pour the ganache glaze over the cake and gently coax the glaze to the edges so that it drips down a little without running down. The chilled mousse will set the chocolate, so you need to work quickly. Top the cake with a few fresh raspberries and chill until ready to serve. The cake can be made a day in advance of serving.